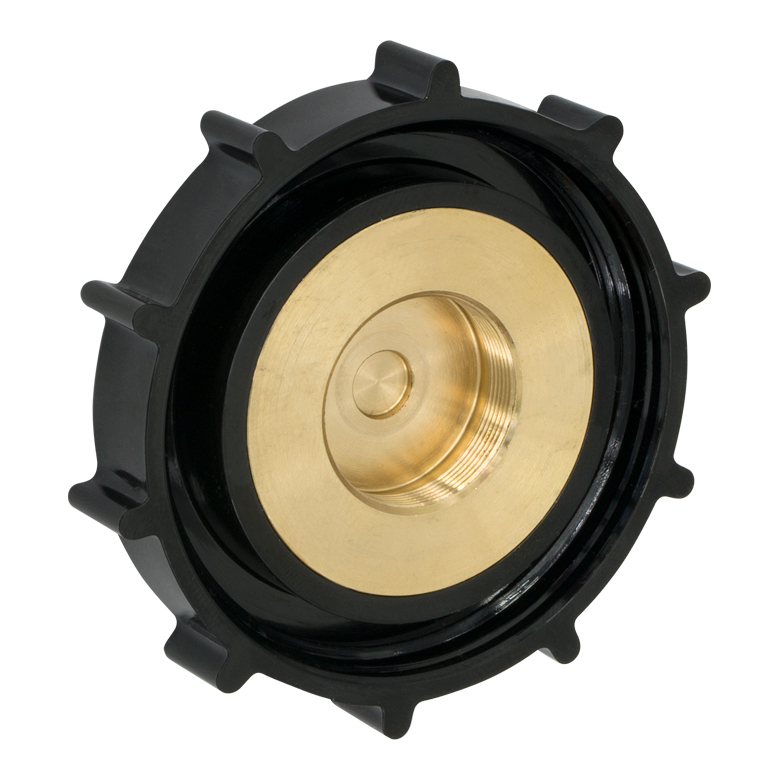 Assembled objective containers have an air gap around the objective to prevent abrasion damage. 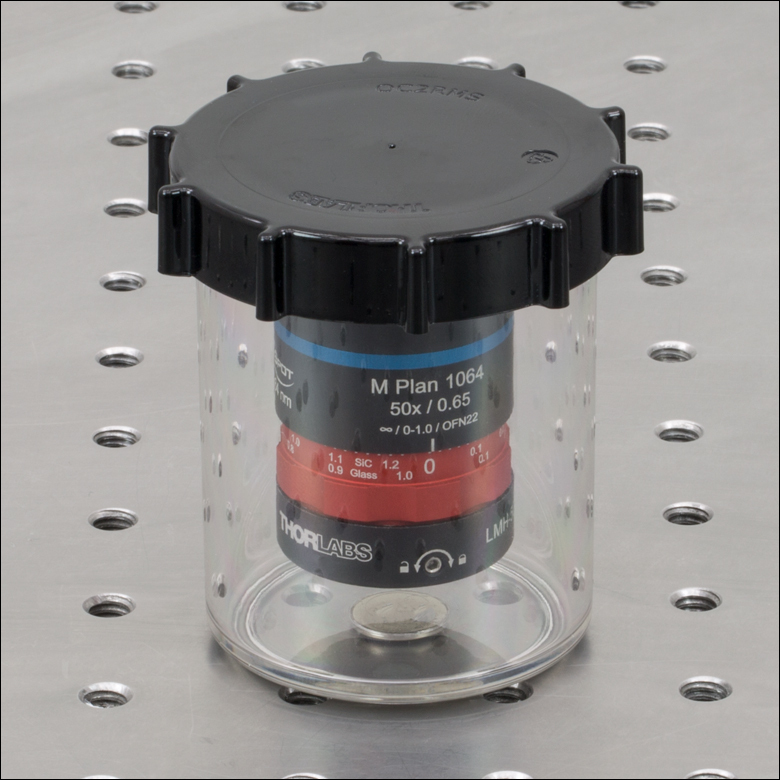 Thorlabs offers both objective cases and caps to protect microscope objectives. Our cases are ideal containers for objective storage and transport and are available for objectives with RMS (0.800"-36), M25 x 0.75, C-Mount (1.000"-32), M26 x 0.706, and M32 x 0.75 threading. 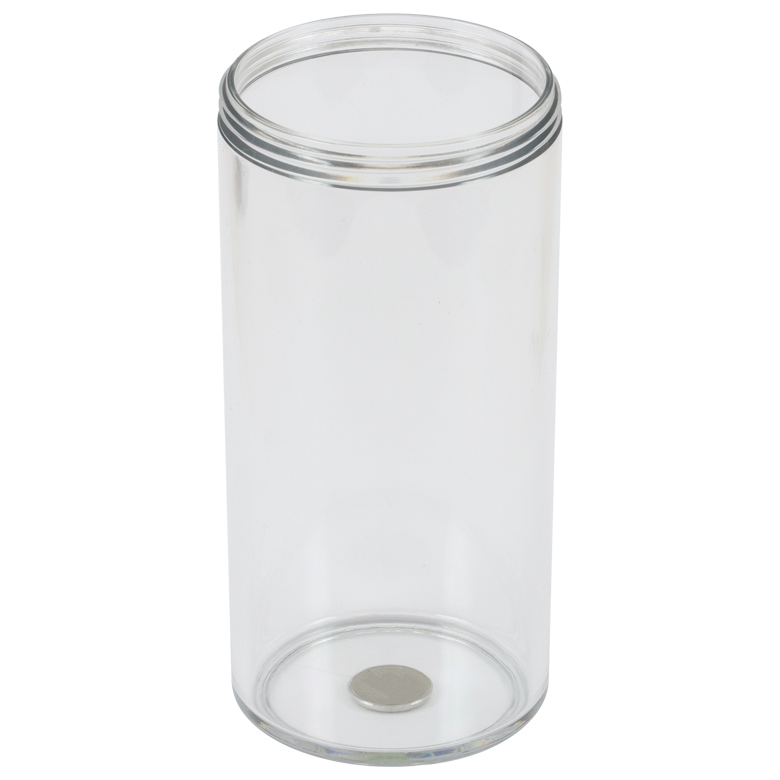 Two canister sizes are available to fit objectives with a shoulder-to-tip length of up to 91.0 mm (3.58"). SM05 (0.535"-40) and SM1 (1.035"-40) threaded options are available for optical assemblies built using our Ø1/2" lens tubes or Ø1" lens tubes, respectively. We also offer RMS-threaded caps that can be used to protect the back aperture of an objective or open ports on an RMS-threaded objective turret. SM1-threaded optomechanical adapters can be used to secure a glue-in Polaris® mount in an objective case. features a magnet for stability. These microscope objective cases are comprised of a lid and a canister, each sold separately. 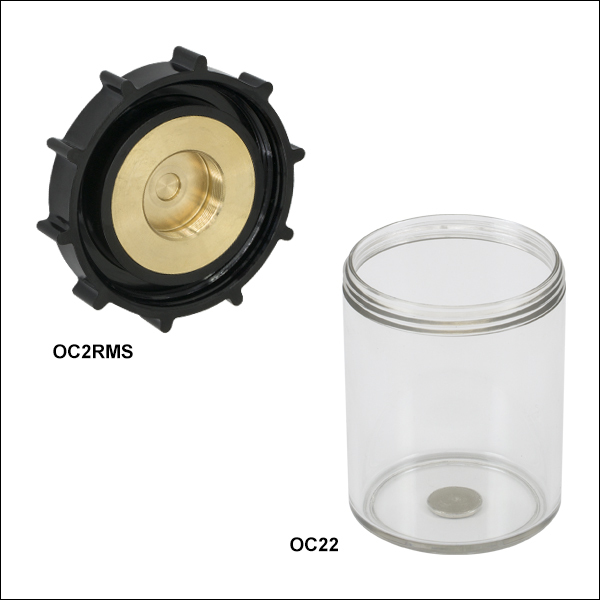 These are designed to store and transport microscope objectives or other small optical assemblies mounted in our Ø1/2" lens tubes or Ø1" lens tubes. Please refer to the tables below for objective compatibility. Each lid has a brass insert with internal threading to secure the objective. 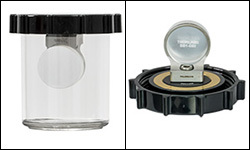 They are designed with large external ridges to reduce the likelihood of the canister rolling when on its side and include an adhesive label for noting the stored objective. Cansiters are offered in two lengths; the maximum allowed objective length is measured from the shoulder to the tip (end) of the objective and does not include the threaded portion. The bottom of each canister has an integrated magnet for stability when upright on an optical table. 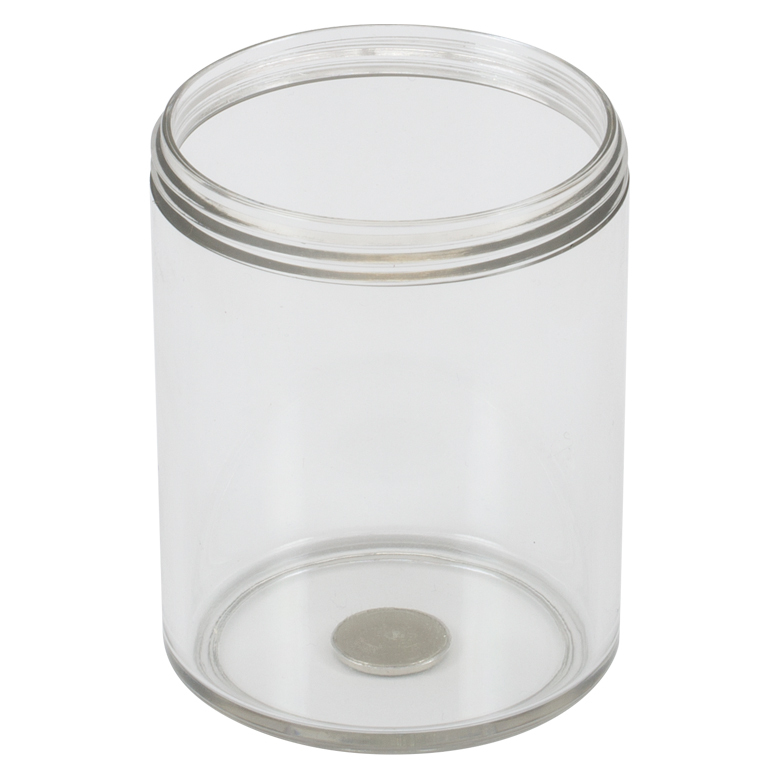 Polycarbonate should only be cleaned with ethanol, methanol, or isopropyl alcohol. Acetone and other solvents may damage the material. Microscope objectives with thread types other than those available here can be mounted to a lid using a thread adapter. We also offer optomechechanical adapters for compatibility with 1/4"-20 (M6) and 8-32 (M4) threaded components as shown in the photo above. 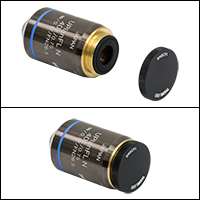 Please ensure that the adapter and mounted component fit together inside the canister; the adapter must have an outer diameter less than 1.81", and the configuration must not exceed the max objective lengths given below. 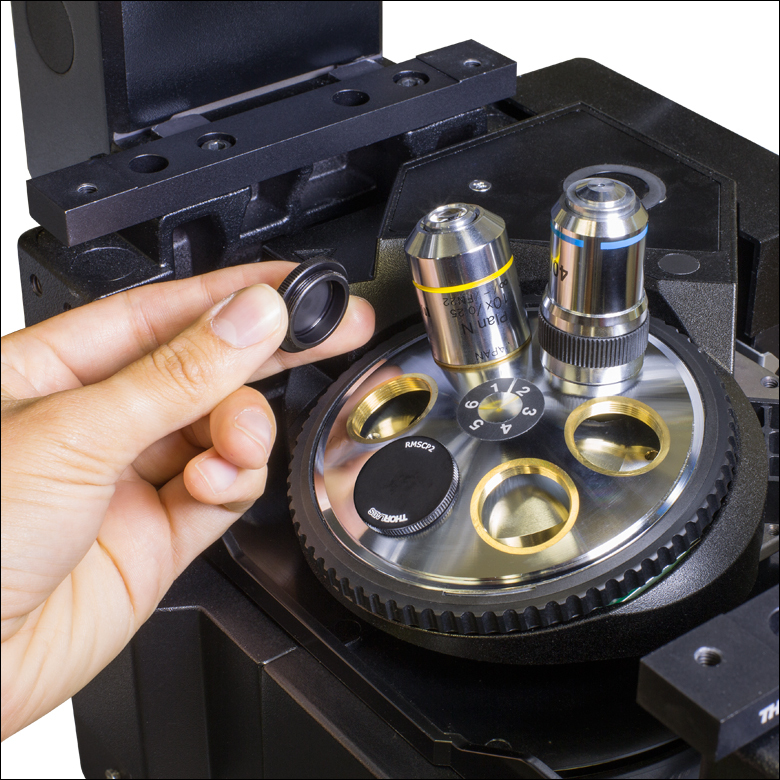 These RMS-Threaded Caps are designed to protect microscope objectives, objective lens turret ports, and other RMS (0.800"-36) threaded components. 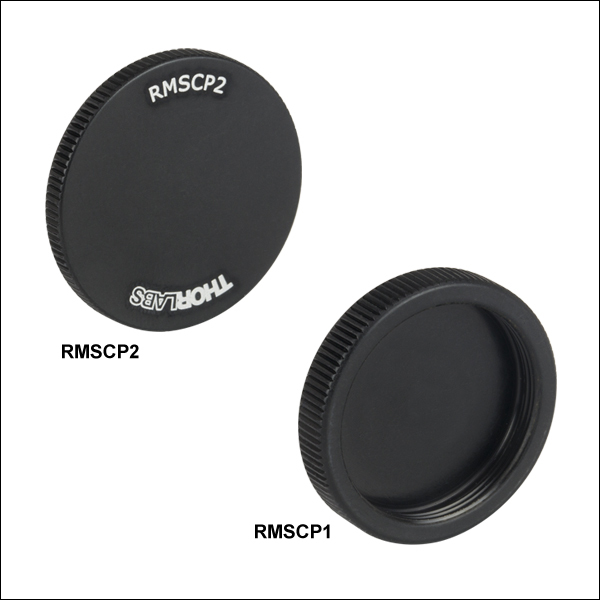 The RMSCP1 has internal RMS threading; with the addition of the RMSA2 adapter, it is also compatible with objectives with M25 x 0.75 threading. 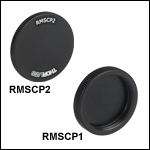 The RMSCP2 has external RMS threading to cover unused lens ports (see far right image). Each of these caps is made from anodized aluminum and has a knurled edge for secure hand tightening.